Matilda of Scotland (c. 1080 – 1 May 1118), originally christened Edith, was Queen of England as the first wife of King Henry I. She acted as regent of England in the absence of her spouse on several occasions. Matilda was the daughter of the English princess Saint Margaret and the Scottish king Malcolm III. She was descended from Alfred the Great. At the age of about six Matilda was sent with her sister to be educated in a convent in southern England, where her aunt Cristina was abbess. It is not clear if she spent much time in Scotland thereafter. In 1093, when she was about 13, she was engaged to an English nobleman when her father and brother Edward were killed in a minor raid into England, and her mother died soon after; her fiancé then abandoned the proposed marriage. In Scotland a messy succession conflict followed between Matilda's uncle Donald III, her half-brother Duncan II and brother Edgar until 1097. Matilda's whereabouts during this no doubt difficult period are uncertain. But after the suspicious death of William II of England in 1100 and accession of his brother Henry I, Matilda's prospects improved. Henry moved quickly to propose to her. It is said that he already knew and admired her, and she may indeed have spent time at the English court. Edgar was now secure on the Scottish throne, offering the prospect of better relations between the two countries, and Matilda also had the considerable advantage of Anglo-Saxon royal blood, which the Norman dynasty largely lacked. There was a difficulty about the marriage; a special church council was called to be satisfied that Matilda had not taken vows as a nun, which her emphatic testimony managed to convince them of. Matilda and Henry married in late 1100. They had two children who reached adulthood and two more who died young. Matilda led a literary and musical court, but was also pious. She was "a women of exceptional holiness, in piety her mother's rival, and in her own character exempt from all evil influence." She embarked on building projects for the church, and took a role in government when her husband was away; many surviving charters are signed by her. Matilda lived to see her daughter Matilda become Holy Roman Empress but died two years before the drowning of her son William. Henry remarried, but had no further legitimate children, which caused a succession crisis known as The Anarchy. Matilda is buried in Westminster Abbey and was fondly remembered by her subjects as "Matilda the Good Queen" and "Matilda of Blessed Memory". There was an attempt to have her canonized, which was not pursued. Matilda was born around 1080 in Dunfermline, the daughter of the Scottish king Malcolm III and the Anglo-Saxon princess Saint Margaret. She was christened Edith, with the Anglo-Norman prince Robert Curthose standing as godfather at the ceremony. The English queen Matilda of Flanders was also present at the baptismal font and served as her godmother. Edith pulled at Queen Matilda's headdress, which was seen as an omen that the infant would be queen one day. The Life of St Margaret, Queen of Scotland was later written for Matilda possibly by Turgot of Durham. It refers to her childhood and her relationship with her mother. In it, Margaret is described as a strict but loving mother. She did not spare the rod when it came to raising her children in virtue, which the author presupposed was the reason for the good behaviour Matilda and her siblings displayed, and Margaret also stressed the importance of piety. When she was about six years old, Edith and her sister Mary were sent to Romsey Abbey, near Southampton in southern England, where their maternal aunt Cristina was abbess. During her stay at Romsey and, some time before 1093, at Wilton Abbey, both institutions known for learning, the Scottish princess was much sought-after as a bride; refusing proposals from William de Warenne, 2nd Earl of Surrey, and Alan Rufus, Lord of Richmond. Hériman of Tournai claimed that William Rufus considered marrying her. Her education went beyond the standard feminine pursuits. This was not surprising as her mother was a great lover of books. Her daughters learned English, French, and some Latin, and were sufficiently literate to read St. Augustine and the Bible. In 1093, her parents betrothed Edith to Alan Rufus, Lord of Richmond, one of her numerous suitors. However, before the marriage took place, her father entered into a dispute with William Rufus. In response, he marauded the English king's lands where he was surprised by Robert de Mowbray, Earl of Northumbria and killed along with his son, Edward. Upon hearing of her husband and son's death, Queen Margaret died on 16 November. Edith was now an orphan. She was abandoned by her betrothed who ran off with a daughter of Harold Godwinson, Gunhild of Wessex. However, he died before they could be married. Edith had left the monastery by 1093, when Anselm, Archbishop of Canterbury, wrote to the Bishop of Salisbury ordering that the daughter of the King of Scotland be returned to the monastery that she had left. She did not return to Wilton and until 1100, is largely unaccounted for in chronicles. After William II's death in the New Forest in August 1100, his brother, Henry, immediately seized the royal treasury and crown. His next task was to marry and Henry's choice was Matilda. Because Matilda had spent most of her life in a convent, there was some controversy over whether she was a nun and thus canonically ineligible for marriage. During her time at Romsey Abbey, her maternal aunt Cristina, forced her to wear the veil. Henry sought permission for the marriage from Archbishop Anselm, who returned to England in September 1100 after a long exile. Professing himself unwilling to decide so weighty a matter on his own, Anselm called a council of bishops in order to determine the canonical legality of the proposed marriage. Matilda testified that she had never taken holy vows, insisting that her parents had sent her and her sister to England for educational purposes, and her aunt Cristina had veiled her to protect her "from the lust of the Normans." Matilda claimed she had pulled the veil off and stamped on it, and her aunt beat and scolded her for this act. The council concluded that Matilda was not a nun, never had been and her parents had not intended that she become one, giving their permission for the marriage. Matilda and Henry seem to have known one another for some time before their marriage – William of Malmesbury states that Henry had "long been attached" to her, and Orderic Vitalis says that Henry had "long adored" her character. It is possible that Matilda had spent some time at William Rufus's court and that the pair had met there. It is also possible Henry was introduced to his bride by his teacher Bishop Osmund. Whatever the case, it is clear that the two at least knew each other prior to their wedding. Additionally, the chronicler William of Malmesbury suggests that the new king loved his bride. Matilda's mother was the sister of Edgar the Ætheling, proclaimed but uncrowned King of England after Harold, and, through her mother, Matilda was descended from Edmund Ironside and thus from the royal family of Wessex, which in the 10th century had become the royal family of a united England. This was extremely important because although Henry had been born in England, he needed a bride with ties to the ancient Wessex line to increase his popularity with the English and to reconcile the Normans and Anglo-Saxons. In their children, the two factions would be united, further unifying the new regime. Another benefit was that England and Scotland became politically closer; three of Matilda's brothers became kings of Scotland in succession and were unusually friendly towards England during this period of unbroken peace between the two nations: Alexander I married Sybilla, one of Henry I's illegitimate daughters, and David I lived at Henry's court for some time before his accession. Matilda had a small dower but it did incorporate some lordship rights. Most of her dower estates were granted from lands previously held by Edith of Wessex. Additionally, Henry made numerous grants on his wife including substantial property in London. Generosity aside, this was a political move in order to win over the unruly Londoners who were vehement supporters of the Wessex kings. 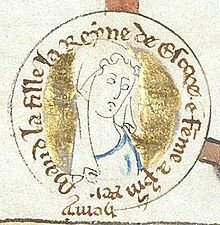 After Matilda and Henry were married on 11 November 1100 at Westminster Abbey by Archbishop Anselm of Canterbury, she was crowned as "Matilda," a hallowed Norman name. By courtiers, however, she and her husband were soon nicknamed 'Godric and Godiva'. These two names were typical English names from before The Conquest and mocked their more rustic style, especially when compared to the flamboyance of William II. Matilda gave birth to a daughter, Matilda, born in February 1102, and a son, William, called "Adelin", in November 1103. As queen, she resided primarily at Westminster, but accompanied her husband on his travels around England, and, circa 1106–1107, probably visited Normandy with him. Matilda was the designated head of Henry's curia and acted as regent during his frequent absences. During the English investiture controversy (1103–07), Matilda acted as intercessor between her husband and archbishop Anselm. She wrote several letters during Anselm's absence, first asking him for advice and to return, but later increasingly to mediate. Matilda's court was filled with musicians and poets; she commissioned a monk, possibly Thurgot, to write a biography of her mother, Saint Margaret. She was an active queen and, like her mother, was renowned for her devotion to religion and the poor. William of Malmesbury describes her as attending church barefoot at Lent, and washing the feet and kissing the hands of the sick. Matilda exhibited a particular interest in leprosy, founding at least two leper hospitals, including the institution that later became the parish church of St Giles-in-the-Fields. She also administered extensive dower properties and was known as a patron of the arts, especially music. Matilda was patroness of the monk Bendeit's version of The Voyage of Saint Brendan, written around 1106–1118. After Matilda died on 1 May 1118 at Westminster Palace, she was buried at Westminster Abbey. The death of her son, William Adelin, in the disaster of the White Ship (November 1120) and Henry's failure to produce a legitimate son from his second marriage led to the succession crisis of The Anarchy. After her death, Matilda was remembered by her subjects as "Matilda the Good Queen" and "Matilda of Blessed Memory", and for a time sainthood was sought for her, though she was never canonized. Matilda is also thought to be the identity of the "Fair Lady" mentioned at the end of each verse in the nursery rhyme London Bridge Is Falling Down. The post-Norman conquest English monarchs to the present day are related to the Anglo-Saxon House of Wessex monarchs via Matilda of Scotland as she was the great-granddaughter of King Edmund Ironside; see House of Wessex family tree. Euphemia (July/August 1101), died young. William Adelin, (5 August 1103 – 25 November 1120), sometimes called Duke of Normandy, who married Matilda (d.1154), daughter of Fulk V, Count of Anjou. "It causes pleasure to see the queen whom no woman equals in beauty of body or face, hiding her body, nevertheless, in a veil of loose clothing. Here alone, with new modesty, wishes to conceal it, but what gleams with its own light cannot be hidden and the sun, penetrating his clouds, hurls his rays." She also had "fluent, honeyed speech." From a poem of Marbodius of Rennes. ^ Weir, Alison (2017). Queens of the Conquest: England's Medieval Queens. p. 126. ^ Huneycutt, Lois (2003). Matilda of Scotland: a Study in Medieval Queenship. Woodbridge: The Boydell Press. p. 10. ^ "The Life of St Margaret, Queen of Scotland". Archived from the original on 6 July 2011. Retrieved 14 March 2011. ^ Hilton, Lisa (2010). Queen Consort. New York City, New York: Pegasus Books LLC. p. 42. ISBN 978-1-60598-105-5. ^ Hilton, Lisa (2010). Queen Consort. pp. 42–43. ^ Hilton, Lisa (2010). Queen Consort. p. 43. ^ Hilton, Lisa (2010). Queen Consort. p. 45. ^ Hilton, Lisa (2010). Queen Consort. pp. 44–45. ^ Hilton, Lisa (2010). Queen Consort. pp. 46–47. ^ Huneycutt. Matilda of Scotland: a Study in Medieval Queenship. p. 73. ^ Hilton, Lisa (2010). Queen Consort. p. 50. ^ Huneycutt. Matilda of Scotland: a Study in Medieval Queenship. p. 76. ^ Hilton, Lisa (2010). Queen Consort. p. 53. ^ Hilton, Lisa (2010). Queen Consort. p. 63. ^ Hilton, Lisa (2010). Queen Consort. pp. 47–48. Ritchie, R.L.G. (1950). The Date of the "Voyage of St Brendan". Medium Ævum. Oxford, UK: Society for the Study of Medieval Languages and Literature. 19: 64–66. doi:10.2307/43626381. ISSN 0025-8385. JSTOR 43626381. OCLC 6733541455. (Registration required (help)). Hilton, Lisa (2010). Queens Consort: England's Medieval Queens from Eleanor of Aquitaine to Elizabeth of York. New York, NY: Pegasus Books LLC. ISBN 9781605981055. OCLC 649718519. Hollister, C. Warren (2001). Frost, Amanda Clark, ed. Henry I. New Haven: Yale University Press. ISBN 9780300143720. OCLC 907375996. Huneycutt, Lois L. (2003). Matilda of Scotland: A Study in Medieval Queenship. Rochester, NY: Boydell Press. ISBN 9781846151149. OCLC 229990725. From a poem of Marbodius of Rennes. Weir, Alison (2017). Queens of the Conquest: England's Medieval Queens. London, England: Penguin Random House UK. ISBN 9781910702079. OCLC 1003999244. Wikimedia Commons has media related to Matilda of Scotland. Women's Biography: Matilda of Scotland, queen of the English, contains several letters sent and received by Queen Matilda.